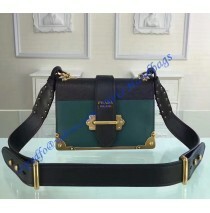 Prada products follow the ‘’inward luxury’’ path. In plain words, it means that their bags and accessories are made to be recognized by those who know where and what to look for. As the result, we never see flashing logos or massive sayings on their products. Each bag is made to be recognized by the one who will want it. Regardless of this, all Prada bags are well-known across the globe. Prada Cahier Bag Black is here! This bag is something to desire right now. It can be paired with jeans, t-shirts or with an elegant dress and it will still look just right. Obviously, this is just one of the main advantages the bag has to offer. Additional elements, made from bronze-colored metal are extraordinary. It is actually one of the main reasons why this bag is so special and extraordinary. In addition, these elements are the first thing an observer will notice. And yes, they are present all around the bag and on each part of it! 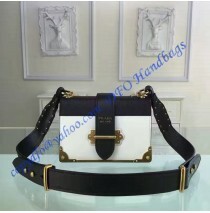 Made from calf leather and decorated with bronze-colored metal pieces, the bag is durable in the lack of a better word. It will last as long as an owner needs it and there won’t be any quality issues with it. Inside a bag, once you pass by lace closure are two main pockets and two compartments. In general, they are large enough to allow for the owners to place most of the credit cards, coins, and other belongings into them. They are also stretchable and easy to remove an item from them. Logo of Prada is implemented on most metal pieces. Nappa leather lining is added as well. Paired with the leather we mentioned and the metal, the bag looks cool and each person can see it will last for a long period of time. Dimensions of 7.9 x 5.5 x 3.4 inches are just right. The bag isn’t too large, so those who need convenient bag will appreciate it. They will appreciate the size as well. 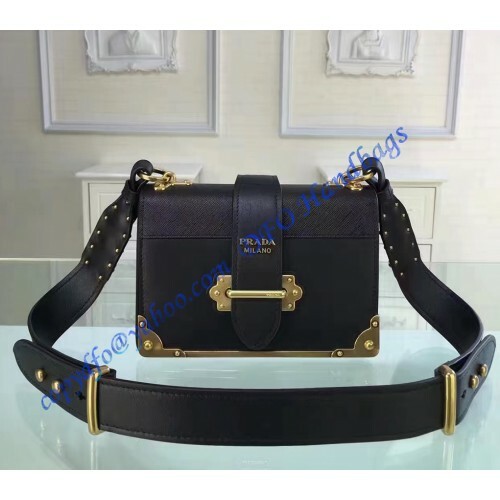 The bottom result is the fact all individuals, regarding of the main desire they have in mind will be satisfied with the bag. Of course, those who only want to be noticed will enjoy it also. 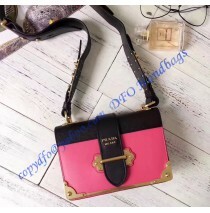 Prada Cahier Bag is one of rare and desirable fashion accessories available today. Finding a similar or even worse, the same type of a bag is almost impossible.